The last fall turkey tag had come in the mail in 2004. Now, four years later, Game and Fish sent me another one, again for hunt Unit 22. The ‘where to hunt’ question had an easy answer. It’s a place, actually it’s the first waterhole in the woods I had been introduced to when I came to this great country in 1977. Little has changed since then, with regard to turkey hunting. The junipers have grown, for sure. Elk have moved to the area. Roads have been washed out deeper. And now we must get drawn for fall turkey and use a shotgun. I don’t know what’s worse, no longer allowed to hunt them with a rifle, or those ‘roads’. In fact, I know of no other non-maintained road – path of naked rocks and boulders is more like it – that is more demanding on your wheels than driving to this waterhole. Even so, I tortured my 4Runner to do just that, at night. Not surprisingly, no camps or other vehicles were in the area. With the alarm going off at opening-morning 4:30AM, I dutifully followed my plan to be set up and ready before the faintest signs of daylight. The only change was due to a waterhole appearing in my dream. 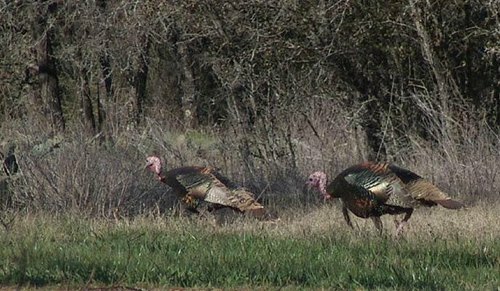 In 2004 I had seen where the turkeys took to roost. With a just-purchased bobble-head decoy I had intended to set up near that roost. The dream convinced me to set up at the waterhole instead. For the first twenty minutes all remained draped in a moonless dark. Choosing the waterhole clearly seemed the better decision. Because a majestic bull elk had announced his whereabouts up the hill, then came in on a mission to apparently drink this hole half dry. My 10x30 glasses barely displayed him as he was sucking water for an easy five minutes. When he was finally done there was noticeably more light, giving away his six by seven rack. Nice treat to begin a hunting day. He disappeared back into the woods from where he’d come. Then my heart sank. No longer would I be alone. The quad announced itself long before its headlights were visible. Worse, the jerk riding it was a) too late since it was almost light enough to see across the pond, and b) drove to within 20 feet of the water’s edge before shutting lights and engine off. Jerks like him abuse a quad. If you don’t think you can walk in and must use such machine what’s wrong with parking at least a quarter mile away?! Wanting the jerk to know that I was already there, not thirty steps from him, I flashed my small light at him, twice. 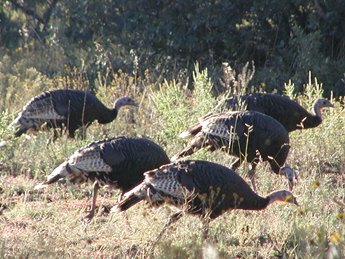 He immediately started his ring-dinger back up, turned on the lights, and sped away, towards my camp, but also towards another waterhole a little lower in the junipers where I had killed my turkey in 2004. With daylight came activity. God really began to pour it on now. First were the jays, loud and obnoxious as always. Woodpeckers followed. Around eight-thirty the first bandtail pigeon landed high up on a dead tree. Hmm, they were still in season! Soon a whole flight joined. If a turkey would cooperate, soon I could also have fun with these annual visitors. Plenty of song birds entered the scene now. The occasional crow sailed by, searching for an unsuspecting meal. Soon the first squirrel (their opening day!) appeared, but scared itself up the nearest tree as it encountered my turkey decoy. Meanwhile the bandtails landed closer towards the water’s edge. Then more intrusion into my little paradise announced itself. Slower going and quieter, the mechanical mule was nonetheless obvious before it ever came into view, carrying three armed people. Sorry, I have trouble labeling them as hunters, arriving during daylight and driving too close as well. At least they parked about sixty yards away, then slowly walked up. I waved. Even with naked eyes I could see their disappointment that ‘someone’ was already here. What were they thinking! The three drifted back towards their rig, but did not drive off. I would not see them again, however. What did appear, just minutes later, had all, and I mean all the features of a whitetail buck. His path towards the water brought him within about ten steps of my decoy. It was the first time I had seen and heard a deer snort in Arizona. But it came from his heart, accompanied by a twenty yard flight back into the woods. OK, so my new plastic beast appears not at all inviting to mammals, no matter what size. The buck meanwhile seemed to be embarrassed about himself. ‘Hero’ now inched carefully back towards the tank. Oh wait, what’s this? Another whitetail buck appeared. They could have been brothers, the first one a forked horn and decent eye guards, the second a fine three-by. Their strategizing, reaching the refreshing water while avoiding the fearsome plastic monster hen, continued for quite some time. In between a band tail landed right above me, easy .410 fodder if I had one on me. Songbirds came within spitting distance. The sun had conquered the clouds on the horizon. Speaking of conquering, the bucks never made it to water. Because right about then I heard them, turkeys clucking. Their approach sounded from my right and back. Figures! Where the barrel just won’t point as long as I was sitting in my chair. So I had to get up, very slowly. Of course not slowly enough. Turkeys have little brains, but we can’t fault their eyes. At least one had made me, and turned around. Even though they were in pretty thick brush, I could tell their nervousness had immediately increased. Fortunately, their lack of brains helped. One thirsty bird stepped just a little too far into an opening, within range. My twelve gauge, thundering and spewing #2 and # 7-1/2 hail, ended it all. Ended the young turkey’s life in convincing fashion; ended the flocks’ desire for this water; ended the bandtails’ visit, ended the bucks’ attempts to quench their thirst here; ended the songbird busyness, scared away every jay and woodpecker and raven. This waterhole suddenly was a very lonely place. I tagged my turkey, gathered chair and decoy and flashlight and fanny pack, and surrendered the waterhole. With a smile, certainly an inner one, I wandered into camp, if you can call a parked Toyota that. However, my best-laid plans to process the turkey, then go after pigeons and squirrels, went down, literally. My ride had a flat tire. That by itself wasn’t so bad. The fact that my spare had not even a thousand miles on it was no problem, either. But with the rest of the Toy beyond a quarter million miles, dutifully delivered in the last twelve years, the original spare was over twelve years old. And it would have to crawl over about forty minutes worth of rock after rock. Would that old tire hold up? I decided right there and then that this had been an exceptionally great morning of hunting, that this flat tire could take nothing away from it, and that I would simply and joyfully drive home. Assuming that I’d make it out without another tire failure, I decided to visit Discount Tire the same day to get things fixed. And besides, I’d be back in two weeks anyway to this very area, looking for a cow elk.